I had read "Easy," also by Tammara Webber and I really enjoyed it. I recommended that book to a friend. 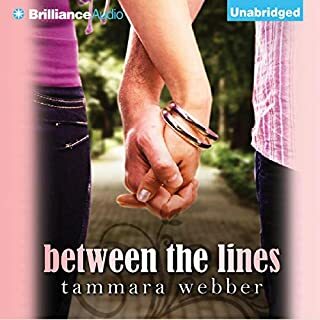 When I started "Between the Lines," I wanted to feel the same satisfaction I had before. About halfway through the book, I came to terms that it probably wasn't going to happen this time around.There are many characters. For me it was easy to confuse who's whos manager, friend, castmate, etc. Reid and Emma were interesting characters but I feel THEIR story just kind of fizzled out. I know this book is part of a series, but a more distinct break in the relationship would have made it better.For these reasons and then some, I would not recommend this book. The most interesting aspect of this story was the insight into young Hollywood. The story depicts well the complexities of being a young actor/actress and the lives they lead on and off camera. Have you listened to any of Kate Rudd and Todd Haberkorn ’s other performances before? How does this one compare? I don't think so. Todd Haberkorn, as the voice of Reid, really captured the inflections of a ~18yo. My only criticism is that all the male character he voiced sounded the same. Kate Rudd gave Emma more mature tone. The story was good about 4 hours in. After that, it never went anywhere for me. I do not intend to read the remaining books of the series.